It finally happened. My 22 month old figured out how to work something before I did. Let me introduce you to Brobo - a huggable night-light Robot. Brobo and his "Shine Force" plush toys are perfect for helping moms and dads with putting kids to bed. The Brobo line of huggable night lights comes in 5 different options. They were developed by Canadians Jeff Lai and Kim Blair. We were recently sent Dog, and my daughter is in love. While she enjoys cuddling Dog, her favourite thing to do is activate his Shine Force that has three settings: a bright mode for adventures, a dim mode for sleepy-time, and auto-off after 5 minutes, for when your child falls asleep. After I opened the package, I just pressed Dog's Shine Force with my fingers. Silly me. Hannah figured out you need to swipe his tail over his chest to activate it. I can see this toy becoming very handy if and when unwanted visitors appear in Hannah's dreams...or under her bed. Since the development of the toys, they have won some prestigious awards, including Creative Child magazines "2013 Toy of the Year" and were on Parenting Magazines "Parenting Toys of the Year 2012 Playlist". Brobo and his Shine Force are CCPSA, CPSIA and ASTM F963-11 tested and approved for your child's safety. Recommended for 18 months and up. You can watch more Brobo videos on the Brobo YouTube channel, including an numbers song and an alphabet song. 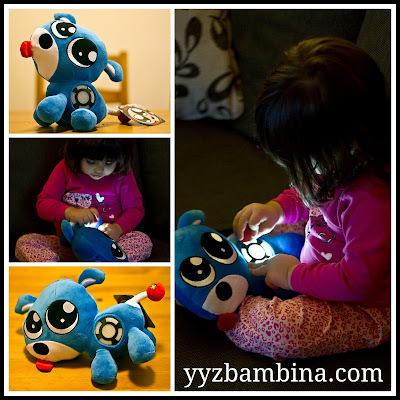 One lucky YYZ Bambina reader will win one Shine Force friend! Open to Canadian Residents (excluding Quebec) who are the age of majority only. Valid entries only. Contest ends December 18, 2013. For further contest rules, refer to the Terms and Conditions within the Rafflecopter. Disclosure: I received a Brobo in exchange for this review. As always, the opinions on this blog are my own. A friend's grandchild would love it. I would give this to my niece C.
I would love to give my Shine Force Friend to my nephew! I would give this to my 1 year old son. They are soo cute! To my 4 year old who all of a sudden has developed a fear of the dark. I'd give the Shine Force Friend to my daughter. One of my boys would get him! (don't know which one yet, likely the 4 year old.